The 75-foot Burrard Cleaner No. 9, designed by MARCO Pollution Control of Seattle, is the largest oil spill recovery vessel serving Canada. A new design oil spill recovery vessel from MARCO Pollution Con- trol, one of the world's largest build- ers and designers of these type ves- sels, was recently commissioned by a Canadian owner. 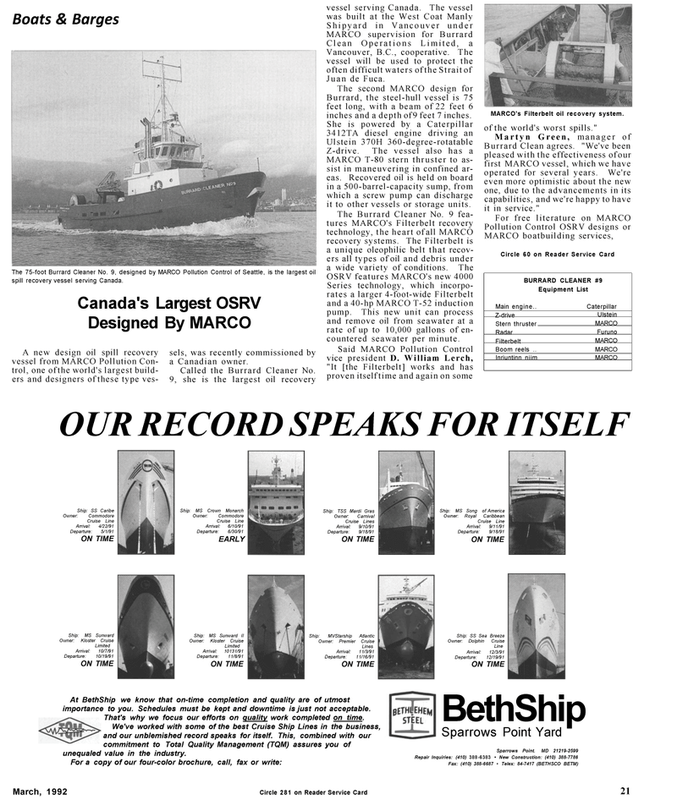 Burrard, the steel-hull vessel is 75 feet long, with a beam of 22 feet 6 inches and a depth of 9 feet 7 inches. MARCO T-80 stern thruster to as- sist in maneuvering in confined ar- eas. Recovered oil is held on board in a 500-barrel-capacity sump, from which a screw pump can discharge it to other vessels or storage units. Series technology, which incorpo- rates a larger 4-foot-wide Filterbelt and a 40-hp MARCO T-52 induction pump. This new unit can process and remove oil from seawater at a rate of up to 10,000 gallons of en- countered seawater per minute. MARCO's Filterbelt oil recovery system. of the world's worst spills." Burrard Clean agrees. "We've been pleased with the effectiveness of our first MARCO vessel, which we have operated for several years. We're even more optimistic about the new one, due to the advancements in its capabilities, and we're happy to have it in service." At BethShip we know that on-time completion and quality are of utmost importance to you. Schedules must be kept and downtime is just not acceptable. That's why we focus our efforts on quality work completed on time. We've worked with some of the best Cruise Ship Lines in the business, and our unblemished record speaks for itself. This, combined with our commitment to Total Quality Management (TQM) assures you of unequaled value in the industry.